After India’s answer to The Fast and the Furious (2001), Dhoom (2004) went on to become one of the highest grossing Hindi films of 2004 and the mega successful Dhoom: 2 (2006) broke several box-office records for opening day and opening weekend grosses upon its release, fans were left humming ‘Dhoom Machale’ while patiently waiting for a third installment in the popular film series to arrive. After a whopping seven year wait, Dhoom: 3 is finally upon us, a sequel, which to be honest, many thought would never become a reality as it seemed to be in development for quite a number of years before anything became official. Reported to be one of the biggest budgeted Indian films of all time and the first Bollywood feature to be released in the IMAX motion picture format, Dhoom: 3 is written and directed by Vijay Krishna Acharya, who wrote the previous Dhoom outings and is produced by Aditya Chopra. The film stars Bollywood perfectionist Aamir Khan as the antagonist Sahir, opposite Katrina Kaif in her only 2013 film role. Abhishek Bachchan reprises his role as super-cop Jai Dixit and Uday Chopra also returns as his lovable partner Ali Akbar. Cirque du Soleil, Bollywood style! The film begins with a terrific introduction set in 1990 Chicago where Iqbal Haroon Khan (Jackie Shroff), who runs The Great Indian Circus, is in a tight spot as the Western Bank of Chicago, who previously lent money to Iqbal, decide to close his circus down after he is unable to repay their loan. Young Sahir (Siddharth Nigam), Iqbal Khan’s son, pleads with the bankers asking them to reconsider their arrangement with his father but their minds have already been set in stone, furthermore tragedy strikes, which leaves Sahir devastated. We cut to present day where an older Sahir Khan (Aamir Khan) is still determine to take his revenge on the Western Bank of Chicago who shattered his childhood many years ago. To settle the score with the establishment, Sahir robs various branches of the bank using his acrobatic skills to escape while leaving behind a message in Hindi and a clown mask. With Chicago police unable to seize the thief, Indian super-cop ACP Jai Dixit (Abhishek Bachchan) and his comical partner Ali Akbar (Uday Chopra) are called to help solve the case. All the while Sahir has plans to revive his father’s The Great Indian Circus with a new lead female acrobat, Aaliya (Katrina Kaif) and an unbelievable disappearing act, which he is certain will astonish all attendees. Opening night is a success, however, Jai, Ali, and the Chicago police surround Sahir after the show suspecting him of the robberies. With no concrete evidence or proof of his involvement in the heists, Sahir is let go leaving Jai wondering whether Sahir has an enormous trick up his sleeve, a trick that could not only be deceiving the Western Bank of Chicago but the entire Chicago police department as well. With anticipation for Dhoom: 3 soaring, I’m happy to report that the film doesn’t disappoint thanks to the enormous amount of effort that has clearly gone into the project. Headline star Aamir Khan, 3 Idiots (2009), who is regarded as one of Indian cinema’s most influential actors, does a tremendous job keeping the film alive with his multilayered character work on Dhoom: 3. Aamir is the heart and soul of the picture, but it’s not until the film’s mid-point where audiences discover the twist in the plot and the key reason why Aamir Khan was chosen to play Sahir. Khan’s brilliant, angst-ridden, revenge-seeking, street-smart Sahir is a complex character expertly brought to life by one of Bollywood’s best, even as an antagonist Khan induces compassion with the audience in his role, once again proving that he is a master of his craft. 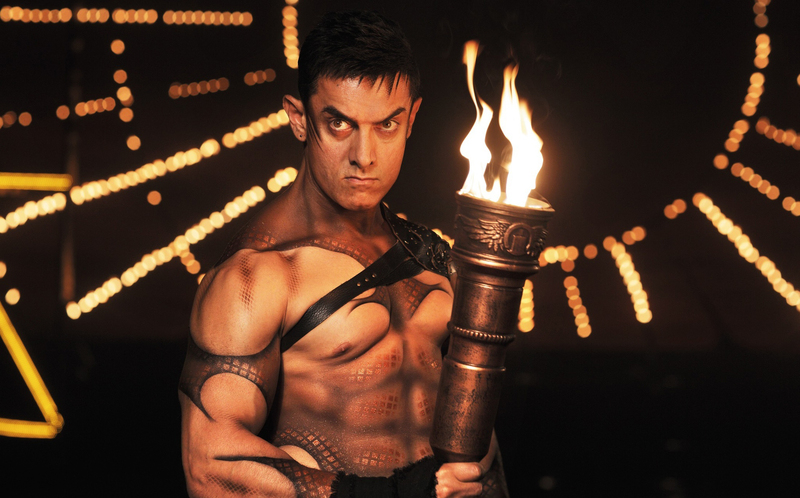 Aamir Khan also spent months physically preparing for the role of Sahir, he learnt ballet, aerobatics and the French technique of parkour, a method of movement focused on negotiating obstacles with speed and efficiency, Khan should be commended for his hard work here. Abhishek Bachchan, Dhoom (2004), once again plays it ‘cool’ as the firm no-nonsence officer Jai Dixit and holds up surprisingly well alongside Aamir Khan. Unfortunately though Bachchan, who had to loose nine kilos to prepare for his role in the picture, doesn’t have as much screen time in this third installment, limiting his character development on the whole. Uday Chopra, Pyaar Impossible! (2010), is entertaining as the lady-crazed Ali, despite being in a role that generally has nothing new to offer, and while this was clearly Aamir Khan’s show, fans of the Dhoom series were perhaps hoping to see a little more of their favorite cops Jai and Ali. Katrina Kaif, Ek Tha Tiger (2012), a powerhouse performer who also deserved more screen time, brings some real magic to the film in her brief yet unparalleled scenes. Kaif shows off impressive athleticism and obvious glamour in a series of high-flying acrobatic pieces and breathtaking dance sequences. It’s a shame her character Aaliya wasn’t explored a little deeper, regardless Kaif has, without doubt, left her mark as one of India’s most striking stars. Finally, newcomer Siddharth Nigam, who plays the young Sahir is remarkable in his minor role, a clear Indian talent to watch out for. Abhishek Bachchan, not pleased with his lack of screen time in Dhoom: 3. While several have criticized Dhoom: 3 for sharing certain parallels with Christopher Nolan’s The Prestige (2006), predominantly ‘the transported man’ magic trick, and his The Dark Knight series, with Sahir’s Joker persona, one can’t help but also notice similarities in location and setting, mainly in its tunnel chase scene as both were shot in Chicago. Others have claimed it’s also borrowed elements from Now You See Me (2013), which are less obvious, as the only similarities the two films share are their heist and magic subject matter. Although it certainly borrows elements from other Hollywood productions, let’s face it, most Bollywood pictures do, Dhoom: 3 still holds up very well on its own. Dhoom: 3 plants most of its emphasis on the villain Sahir and builds an emotional, exciting and sometimes heartfelt tale about family, friendship, love and revenge. While there are obvious holes in the screenplay by Vijay Krishna Acharya, and very little explanation as to how Sahir actually executes some of his extravagant heists, Dhoom: 3 excels when it comes to its overgenerous stunts and chase sequences which take place in a realm that is clearly removed from any semblance of reality. Whether it’s the film’s opening heist, breathtakingly shot by cinematographer Sudeep Chatterjee, Chakde! India (2007), or it’s many car chases featuring James Bond style technology BMW bikes, Dhoom: 3 excels when it comes to action, even Jai and Ali’s unintentionally hilarious introduction in India, which will leave you convinced that Indian houses are made out of paper, is fun, although tonally out of place with the rest of the picture. Music composed by Pritman is first-rate all the way with each dance sequence being simultaneously extravagant, mind blowing and a pleasure to witness. From the Cirque du Soleil inspired ‘Malang,’ which reportedly took two months to shoot and cost US$770,000 as two hundred professional acrobats were flown in from the States for the shoot, to Katrina Kaif’s graceful striptease in ‘Kamli,’ or my personal favorite, the ballad ‘Tu Hi Junoon,’ every number is nothing short of outstanding, purely on a technical level and in terms of costume, location and cinematography, the song sequences alone are worth the price of admission. On the whole Dhoom: 3 is a fine entertainer and an enormously satisfying Bollywood blockbuster, its almost three hour run time zooms by thanks to its superb cast and top-notch production values. One can almost guarantee that the picture’s hard-hitting finale at the famous Arch Dam in Ticino, Switzerland, will reside with viewers long after the credits have rolled.